Challenging - this is how Erik Waterman of Waterman Onions describes the current onion season. He also, however, sees enough positive things about the market. "It is often quickly said in other countries that we, here in the Netherlands, always have too many onions. They say this means onions can no longer fetch good prices. This year, however, proved the opposite", Erik says. Demand is currently shifting from overseas destinations to Europe. According to Erik, sales are going well. "Europe is coming knocking. There is demand from all over Europe. For a long time, our onions were more expensive than those of our neighboring countries. "Now, prices in other places are equal to and sometimes higher than those in the Netherlands. Foreign demand is mainly limited to the cheapest, smaller sizes." "Dutch onions have certainly not run out. They are, however, nearing the bottom of the barrel. Statistics show that Germany, for example, also has onion shortages for two or three months. As a trading company, we can, fortunately, change course quickly", explains Erik. 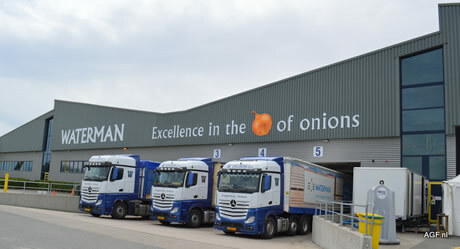 "We have a strong import program to supplement our Dutch onions. For example, we now already import from China and South Africa. New Zealand, Chilean, and Argentinian onions are en route. With these, we can serve our clients until the end of the season." "Imported red onions have already come on to the European market. The prices for these types of onions are good again. Yellow onions are now just behind the red ones. This trend is even stronger when it comes to the organic onions. There will soon be none of these in Europe", continues Erik. "For now, imported onions will be able to meet part of the demand. However, there are still not sufficient volumes to compensate for the entire shortage in Europe. I think demand will undoubtedly increase even further towards March." "Fortunately, the shelf life of our local onions is good. I am also pleased with their color and appearance. We will be able to serve our clients in various countries well. The trade show in Berlin (Hall 3.2, Stand C27) is also a good opportunity to hash out supplementing the season further", concludes Erik.